Creating a special and beautiful image for the holidays is very important for any girl of any age. Bright and stylish hair accessories would contribute greatly to creating such image. Simonetta offers here gold velvet handmade hair band for bright girls. It would look great with an elegant dress or top and skirt set, sparkling brightly thanks to the side bow, decorated with diamante gems. Hand bags and shoulder bags are vitally important for women and girls for all occasions, especially for some festive ones. Serving perfect addition to a smart dress or elegant set, they are at the same time used for keeping all the small things, needed during the party. The handbag by Dolce & Gabbana is made from beautiful, silky lace jacquard. Gold metal zips, a logo metal plaque make it look really stylish and bright. Beautiful embroideries are extremely popular this season and without any doubts they contribute to creating a smart and tender feminine image. 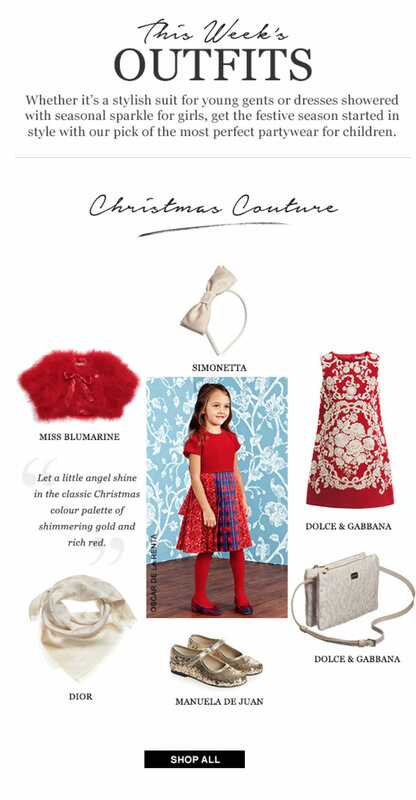 The elegant dress by Dolce & Gabbana is one of the examples of the stylish outfit for girl’s wardrobe. It is made of soft viscose blend with all over ivory embroidery. It would look great with ivory bolero and red shoes, making your girl look stunning for some special occasion. Boleros are often used as bright additions to elegant dresses or top and skirt sets, for adding charm to the general outfit and at the same time for extra warmth during cold time of the year. Here we suggest you considering the red fur bolero by Miss Blumarine. Silky soft lining adds to its comfort, whereas hook and eye fastening on the front makes the dressing process easy. Scarves belong to traditional accessories, worn during any time of the year and with most types of clothing. The gold scarf by Dior, being made from a soft silk and wool mix, would for sure contribute to making the image of your girl brighter, at the same time adding warmth. Classical frayed edges of the scarf add charm to it. If you are looking for beautiful high quality shoes for special occasion, pay attention to the beautiful soft leather shoes by Manuela de Juan. Made with gold glitter all over the shoes, finished with edge golden trims, they look stylish and bright. The rubber sole guarantees, that your girl, irrespective of her age, would feel safe and comfortable.